For all intents and purposes, time has stopped. The small, circular kitchen in the Pentagon is all but frozen in time, as millions of water droplets, knives, frypans and carrots hang in the air. Plastic bullets begin to slowly make their way towards the mutants trying to escape the prison, as the ash-haired Quicksilver begins his high-speed run around the room to save his new friends... and have a bit of fun with the guards in front of him. It was, without a doubt, one of the most spectacular scenes of X-Men: Days of Future Past (DOFP). At just over 100 seconds long, it's but a tiny part of the entire time-travelling superhero movie, but visually, the scene is a highlight that combines live action and computer-generated effects so well that filmgoers loudly proclaimed it as one of – if not the – highlight of the film. What you may not know is that alongside the live-action filming and the circular set, the bulk of that scene was created in Adelaide, Australia, by visual effects studio Rising Sun Pictures. Rising Sun Pictures (RSP) has been around since 1995, and has been responsible for creating the visual effects sequences for over 100 feature films. In typical Australian fashion, the company is named after the Rising Sun Inn, the Adelaide pub the founders had their first board meeting in. Its credits are large and varied: the studio has worked on everything from The Great Gatsby to Gravity, as well as a both Wolverine movies and the latter Harry Potter films. With a reputation as a "sequence studio", RSP was always well placed to win its bid for creating one of the DOFP's most iconic moments. But what's truly amazing – especially for outsiders to the industry – is that the team managed to create it all in just five and a half months. In a way, the team at Rising Sun Pictures was lucky with this particular job. Director Brian Singer had an exceptionally clear idea about what he wanted, and did a large amount of prep work before handing the reins over to the South-Australian studio. "The process itself started with Brian [Singer] coming up with the idea, storyboarding it out and then he went through with a company called The Third Floor and they pre-visualised out all of the shots so you have an idea of the moving sequence," explained VFX Supervisor Tim Crosbie. 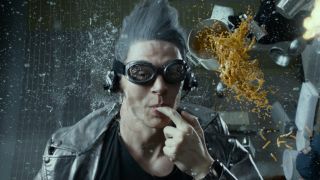 The key premise of the sequence is that the camera enters Quicksilver's world as he runs around the room at ultra-high speed. The low-res render created by The Third Floor allowed the team at Rising Sun to work out the timing of the scene before they began serious work. For example, an early version of the pre-vis had Quicksilver running around the walls twice before he takes out the guards. It was deemed overly long and unnecessary, however, and was taken out before the team began creating it. The pre-vis also allowed RSP to work out the exact camera locations, where the rigs for lighting could be installed and ensured everything was in place for shooting in stereo 3D. This groundwork ensured the effects team was able to hit the ground running when it came to turning the live action footage into the final scene in the movie. Even when watching the kitchen scene up close on the film's Blu-ray release, it's impossible to determine exactly what elements are CG and what is live action. The truth is that almost everything in the scene is digital, either created by RSP or a virtual recreation of a live action shot. The film sequence had about eight cooking pots suspended on wires to fly up at Magneto's control, but everything else – the carrots, the utensils, the pots and pans and even the actors in many ways – are virtual recreations of what was shot in the studio.